Black and white negative of a photograph of the family of Thomas Hall Wilson celebrating the 50th wedding anniversary of Thomas and Catherine Wilson. 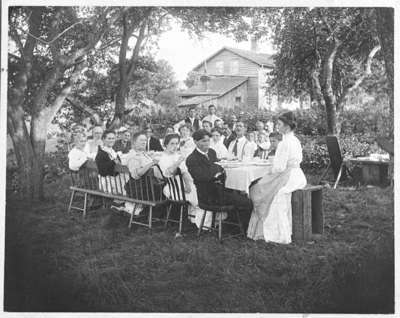 The family is seated at a table on a lawn on Way Street in Brooklin, Ontario. The house in the background. Thomas Hall Wilson is the bearded man, second from the left. His wife, Catherine is seated to his left.